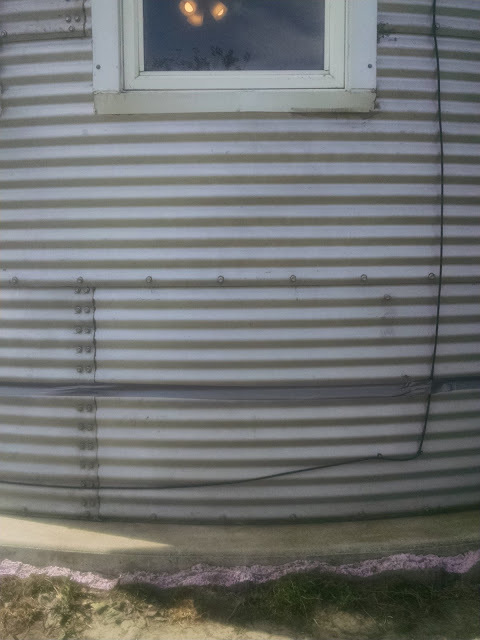 Ring Around The Grain Bin, Our Extra Insulation Works! 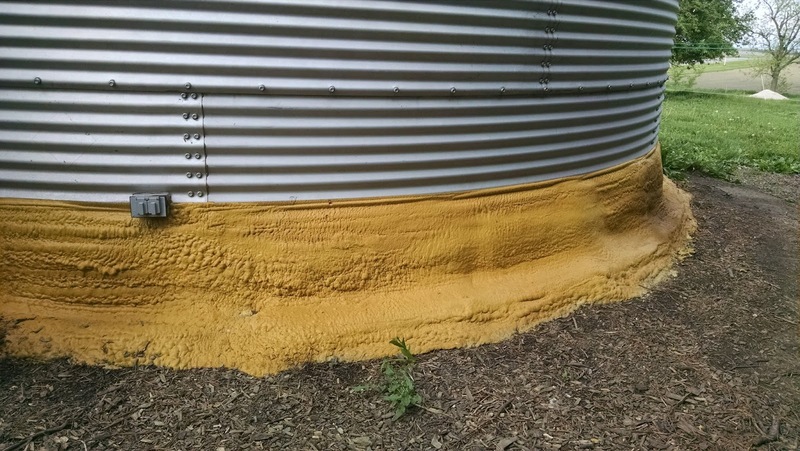 Last September I blogged about the condensation problem we had on the floor inside the grain bin house and our plans to fix it , but first let me backtrack a bit. Originally, when we built our "Looney Bin" (summer of 2015) we had poured the foundation of the bin and then placed pink solid foam boards between the foundation and the earth bermed up next to it. 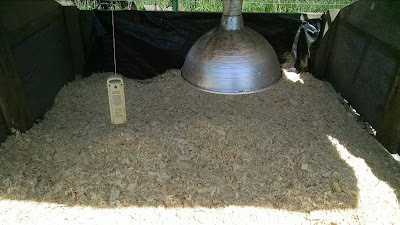 In the picture below the pink foam board had been picked at by our chickens but what you cannot see in the additional 2 feet of foam UNDER the ground. We had never built or insulated a grain bin home before and neither had the man who did the foundation for us, so it was a collaborative effort between us. 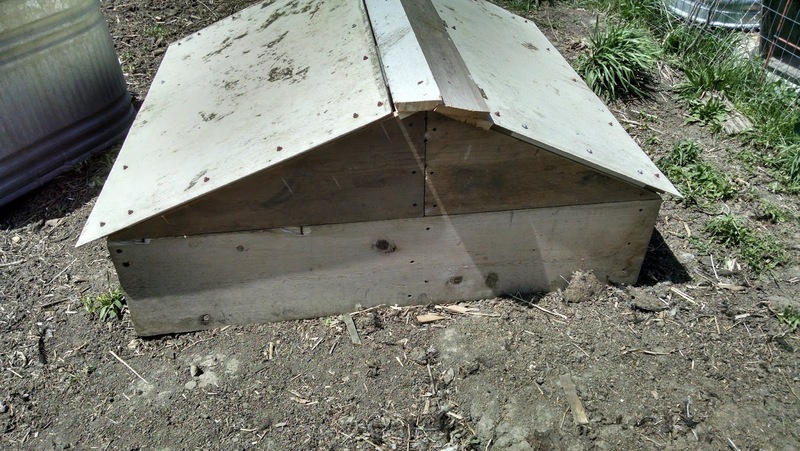 We hoped that by placing the foam board between the concrete foundation and the soil, it would help keep the concrete floor warm in our new abode. 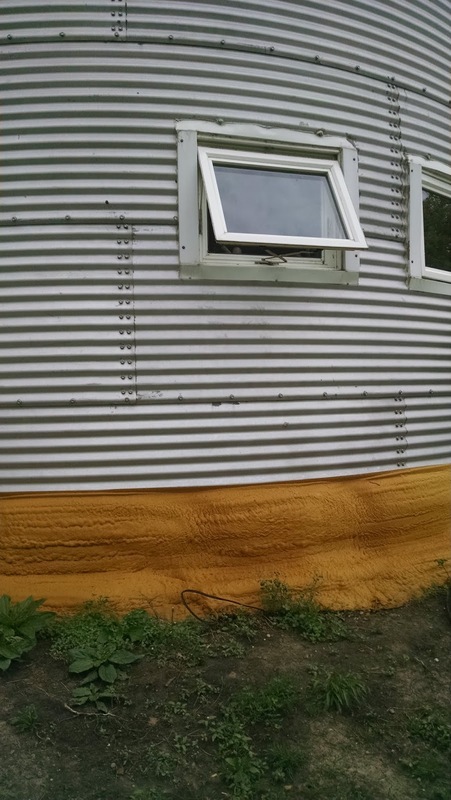 The floor did stay warm, mostly because of the pipe within the floor where the hot gases from the rocket mass stove travel until they go out our chimney, but the portion of our concrete floor nearest the circular wall, stayed cool. Condensation built up on our inside floor about 6 to 12 inches away from the inside wall. We also had a little mold growing in that area. In the winter of 2017 we bought a dehumidifier which helped some but did not completely eliminate the problem. Over the last eight months the lovely mint green color of the spray on foam changed to a not so lovely Harvest Gold of the seventies. I think Carol Brady would approve. But, it accomplished it's goal of eliminating the condensation buildup on the inside floor. This past winter we had no moisture or mold on our concrete floor. Happy days! 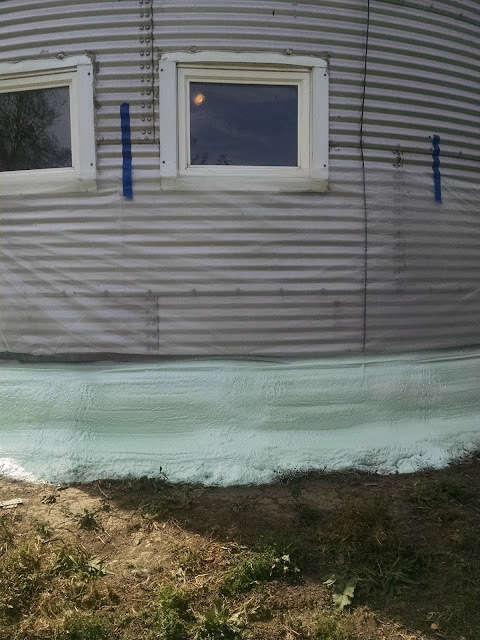 It also stayed intact through rain, ice and snow storms which our insulation guy said it would. 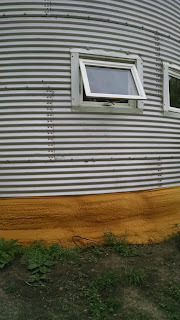 Our next task is to build seating to cover the insulation around the diameter of the entire looney Bin.The seat sides will be made with additional grain bin steal we had purchased from our builder last fall, and will have a wooden top. Which of course must be cut to fit the curved sides of the bench. We might even attach some hinges to some areas in order to store items within the bench such as garden tools, laundry baskets, flower pots, blankets for outdoor seating...once again, the possibilities are endless. 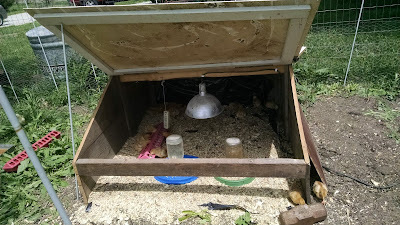 I've posted before about the chickens we've raised for our own meat. We buy them online (usually twenty-five) and they are delivered at one day of age by the US Post Office. When they arrive in our small Post office we're called and we pick them up right away. After about 12 weeks we butcher and process all of them, giving us a great homegrown chicken dinner every two weeks or so. It's never been enough. 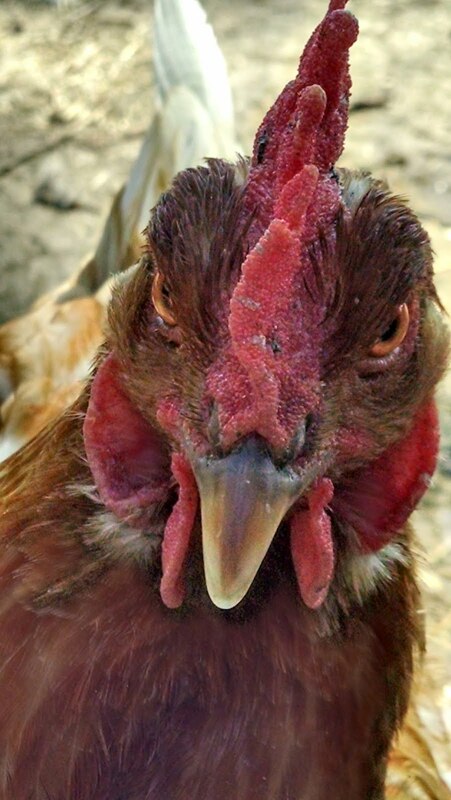 We love our own farm raised chicken! So after our regular fall butchering, we made two big decisions. The first was to double the number of chicks raised for meat from twenty-five to fifty, and the second even more exciting one; TO PAY SOMEONE ELSE TO DO THE BUTCHERING FOR US! 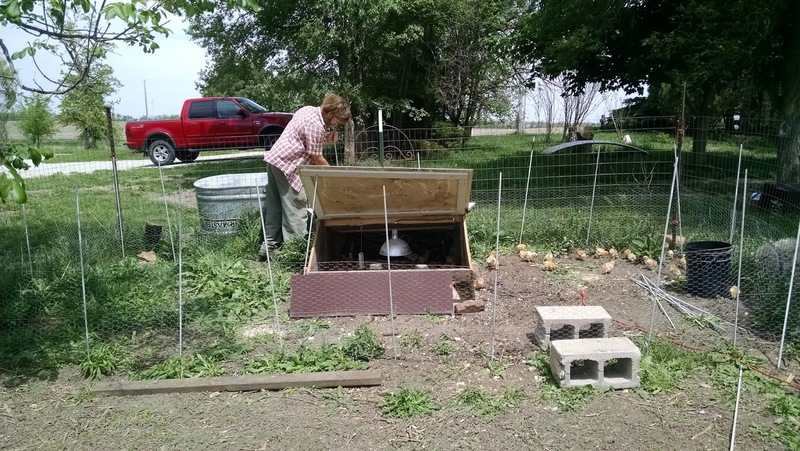 Two weeks ago, our Freedom Ranger broilers arrived. With fifty little cheeps, we needed a larger brooder for their first home. In true recycling fashion Keith build this jewel all from materials on hand. Because baby chicks are very vulnerable to cold weather the first couple of weeks, we lined the earth bottom with heavy plastic and then covered that with wood shavings. 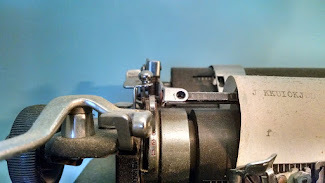 A heat lamp was hung alongside a temperature gauge . 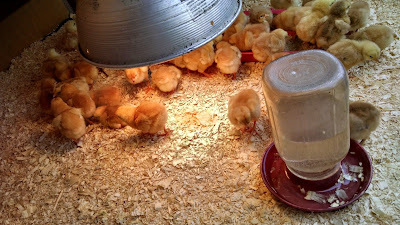 Baby chicks like temps right about 100 degrees the first week or so. 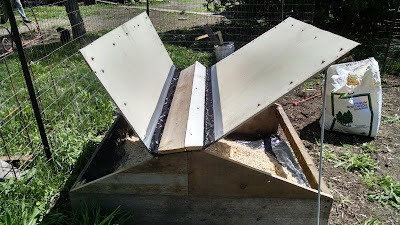 Both sides lift up for ventilation on warm days and the front section will have a removable board placed over it to keep drafts off the babies at night. It's easy to set aside the front board so the chicks can come and go freely as they mature. Below you can see the front board in place. 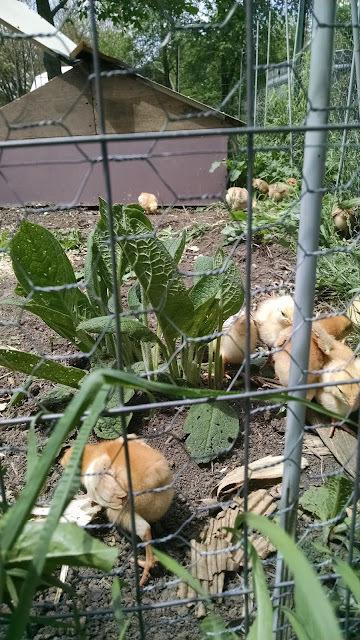 We've located the little broilers at one end of our soon to be sweet corn garden, with a small area enclosed with...wait for it...chicken wire. My sister visited the other day and commented she had seen chicken wire used for many projects, but never actually for chickens! When the chicks are older and our sweet corn is high enough they can't hurt it, we'll turn them into the rest of the sweet corn garden to do bug and grub control. 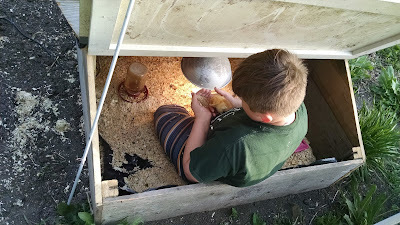 We'll also remove the brooder and give them other shelter from rain for the rest of the summer. That "other shelter" is still on the drawing board. I'm happy that our ten year old grandson Wesley doesn't think he's too big to hold baby chicks any more. 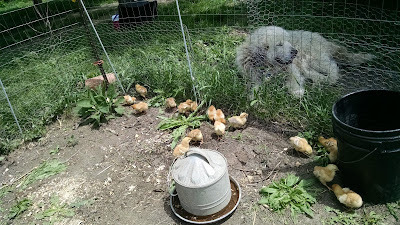 Also thrilled that he can appreciate how we raise them and still be able to enjoy fried chicken at our place. 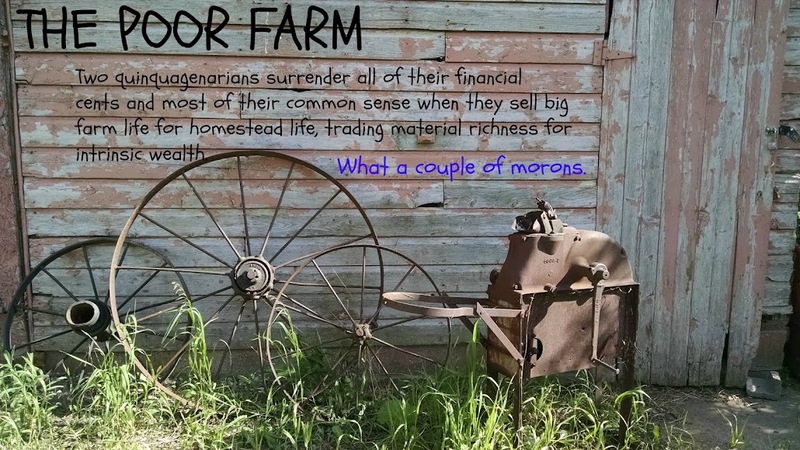 So many youngsters have no idea where their food comes from thinking it's origination point...is the grocery store. When we moved here April 2015 we tilled a small area by our feed shed and planted a few things. 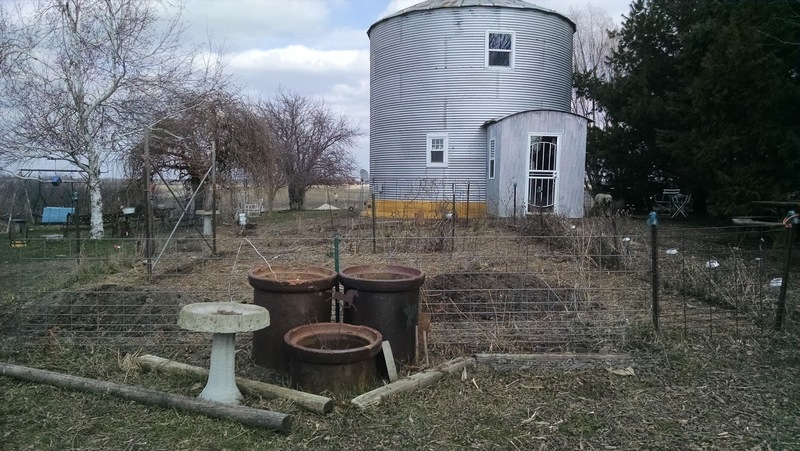 It did not produce well as the ground here was total junk, I was still in school full time and Keith was building our grain bin house. Summer of 2016 went a bit better. The first garden was planted with popcorn and it produced well. 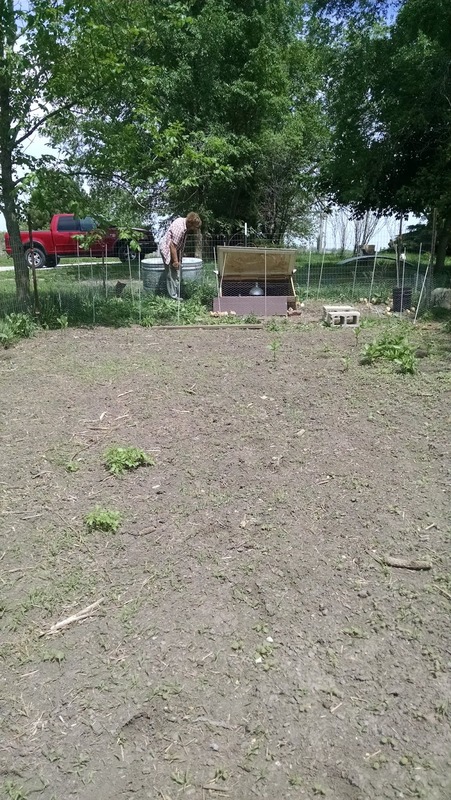 We also tilled a second garden spot by our home but the soil was filled with clay. Some herbs grew and a few tomatoes but not much else except beans. Beans did very well. We ate a lot of beans that summer. Summer of 2017 we tilled a third garden. 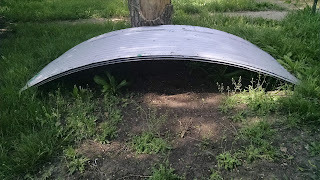 This one was farther away from the grain bin house and the soil was easier to work with. 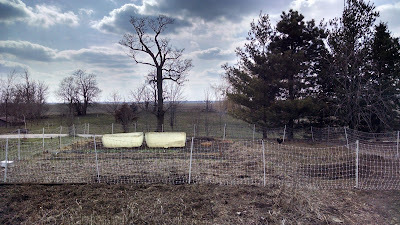 We had a variety of veggies but the weeds got away from us as we were focused on building the new barn. (Excuses? You bet. We have tons of them). 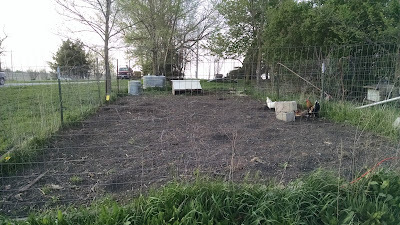 Garden number one was planted with tomatoes that failed, but we turned our broiler chickens into that area and they thrived. So what we lacked in canned tomatoes we made up for with chicken dinners. Garden number one by the feed shed is in its fourth year and the soil is rich and loamy. 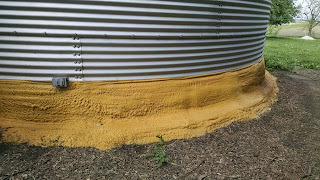 We added lots of organic material to it last summer and plan to fill it with sweet corn and popcorn. It's fenced in so no problems with chickens tearing up things. The few in the picture below are allowed in until we plant. Lots of worms to eat! Garden number two or "The Kitchen Garden" is the one just off our homes entry way and in its third year. It is still heavy with clay but after adding organic material to it in the way of straw, rotted hay, compost from the cows manure pile, and cardboard (!) it is now teaming with earthworms. I've expanded my herbs in this area and planted spinach, lettuce mixes, radishes, peas, cherry tomatoes, spaghetti squash, zucchini, cukes and flowers such as cosmos, zinnias, gladiolas, poppies, coreopsis, nasturtiums, iris, marigolds and sunflowers. I want COLOR this year! I also want to walk only a few feet to gather up salad and flower bouquet material for our home. Garden number three is the Main Garden or Garbage Garden as I often refer to it. 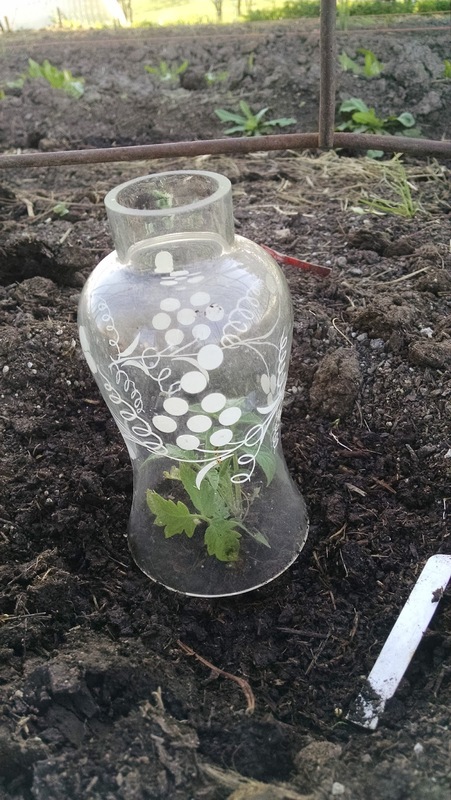 It has been planted with large tomatoes, beans, asparagus, onions, potatoes, cabbage, broccoli, brussel sprouts, garlic, rhubarb, beets, and peppers. It's the Garbage Garden (above) not because of its vegetable contents, but because of Keith's creative ways of protecting tender young transplants. This year he pulled out all the stops, as well as all the "inventory" he'd been saving in the decrepit house, including but not limited to: plastic boxes, plastic milk and juice cartons, antique bricks, wood boards, PVC pipe pieces, old foosball game rods, glass lamp shades and oil lamp globes. 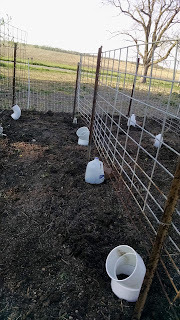 Average and arguably, saner folk, will cover their plants with lovely row covers of similar shape and size, but we are cheap here on The Poor Farm and so we use what is on hand. 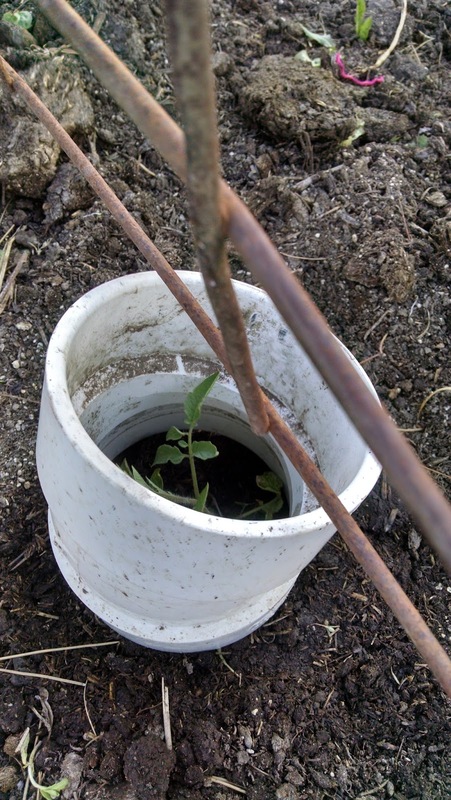 It is a functional, but untidy garden the first few weeks. As the plants grow and become more resistant to weather extremes, and hungry robins, the "inventory" will find it's way back to the decrepit house. How do I know this? Because Keith is the garbage collector and I am the garbage put away-er. I blinked and three weeks went by. I blame our extended holiday. Keith and I made it to Hannibal Mo. for two nights to celebrate our upcoming 25th wedding anniversary. The highlight of our trip was the tour we took of Rockcliffe Mansion in Hannibal. 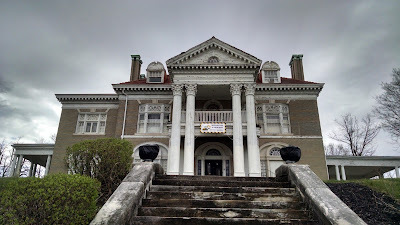 Thirty rooms of early 1900's opulence! We had to go in April because Liz the cow was dried off in anticipation of her calfs' arrival. (She's due any day now.) We stop milking our cows before their due date to allow mama cow to build increased reserves. Thus the reason we went on vacation when we did; it's much easier to get someone to do a few livestock chores when it doesn't include cow milking! Special thanks to our daughter Raven and GK Allana for doing said chores by the way. After that, the weather turned on us. Weeks of cold, rainy, even snowy spring days finally morphed into warmer weather and that called for serious garden time. 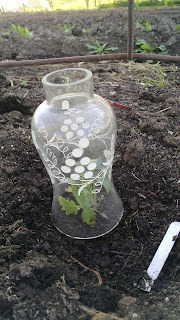 We've been planting something, somewhere, for the last two weeks. This year we'll have three plots: the Potager Garden by the door of The Looney Bin, (herbs, salad stuff and flowers for cutting), the Main Garden father west of that (all the other vegetables not in the Potager Garden), and the Corn Garden out back alongside our feed shed (sweet corn and popcorn). 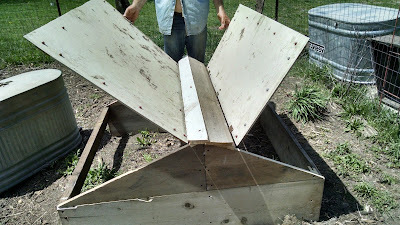 I'll explain why we have three gardens in my next post. 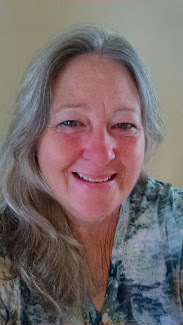 In the midst of that I've been writing and submitting more homestead specific articles. I'm thrilled to report that Self-Reliance Magazine will be publishing my article about DIY Family Cemeteries in their Summer 2018 edition. Most recently I was busy planning for a visit from long lost Indiana cousins on my mother's side. So happy to see them and spend solid time catching up. We met for dinner one night, lunch at my sister Teresa's the next day, followed by caravanning across 6 counties in order to see even more sisters. It was a great weekend. We completely exhausted each other. Today it was hot, and tomorrow will be hotter, in the high 80's, followed by severe thunderstorms predicted at the end of the week. We have a chicken brooder pen to complete, more garden seeds to get in the ground and of course, the barn to finish. Stay tuned, it's going to be one crazy summer!